By The Ohio Chemical Manufacturing Co. Dated 2/43. These were introduced in late 1941 and are often referred to as the A-8B 'bladder mask' in reference to the fine rubber rebreather bag suspended beneath the facemask. The rubber facepiece presents quite well but has in fact hardened significantly and is relatively 'flat' in shape. The rebreather 'bladder' is in very good supple condition and apart from a very small hole has no major issues. The oxygen hose is complete with end connector, seems very flexible but does have surface crazing. Both circlips for the rebreather bag and oxygen hose are absent. 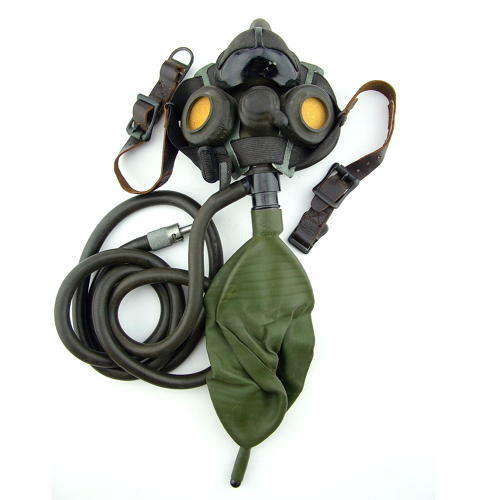 This mask retains the original elastic and leather harness system, part of which has a repair (see photograph). Whilst this is not a perfect example it is still reasonably good and would make an excellent display of these rare and sought after masks. Stock code O22283.